At a recent travel event, former chairman of Skyscanner, Ray Nolan made light of Google’s travel products, assuring the audience they were not the threat some would have you believe. And yet, here we are. All this amounts to positioning the search behemoth squarely between the customer and the travel brand, where it is not hard to imagine a customer journey that requires no direct contact with a brand other than Google. What happens if travel brands and airlines in particular, cede the prime real estate at the top of the trip planning funnel? No customer loyalty. It depends on direct contact with the brand. No ancillary retail which is a $60 billion market. Brand erosion. If Google knows the customers better, and can execute a transaction quicker and cleaner than any brand, does not Google have an opportunity to reduce travel providers to white label suppliers? One defence against the encroaching giant that is Google is consolidation. Ctrip buys Skyscanner; Priceline Group buys Momondo. Some have thought that we might see more of these moves in the near future. However, while travel brands try to raise $1.74bn in disposable income to go buy a meta search service of their own, airlines need to protect their flight data and invest in differentiating their brand from Google to secure the top of the funnel. Google seeks to automate, scale and penetrate a market quickly. It’s their not-so-secret formula. However, Google products lack the unique human connection at the heart of why we travel. 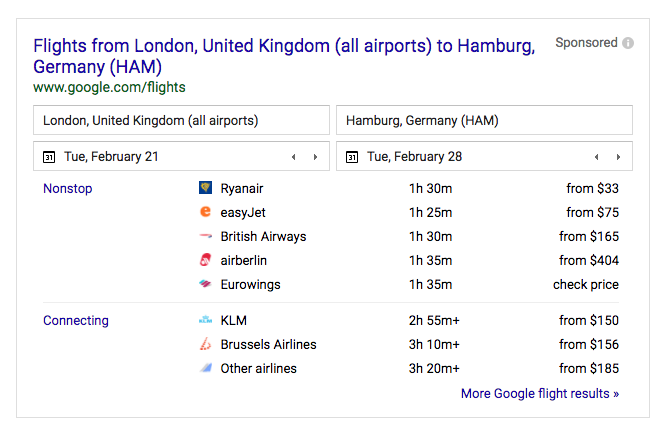 Simply compare Google Trips with Airbnb Trips, the difference is one of curation vs. automation, or human connection vs. machine process. Google streamlines the itinerary, Airbnb does the same but offers unique contextual insight and opportunities for authentic connection with real local people. That’s not to say Google Trips is poorly executed, it delivers a punch, but it does not connect on a personal level and therefore lacks the emotional trigger that builds loyalty. Google’s in-destination recommendations are based on high volume search terms and scraping user generated content that match those terms. The results are often generic and touristy: “Going to London? Why not visit the London Eye.” A visitor might access a destination from the skyline down, but a large segment want to explore beyond the surface, they want to connect on a local level. To combat a machine like Google airlines need to build a brand about human connection in the travel experience. Airbnb achieve this by surfacing the transformative nature of travel, guiding the customer to unique human connection at every touch point. Airlines, positioned at the beginning of most journeys have an unique opportunity to guide customers through the travel process right into the destination. 1) Harness the authority of locals with deep knowledge of their city in every destination on an airline route map. Airlines need to champion the locals who know where to go, eat, play, sleep. If the content is authentic, the airline brand is trustworthy. 2) Personalised marketing. The technology that can build interest-graphs of their customers, whereby affording the airline marketing team the ability to make relevant recommendations by matching the customer to the most appropriate local experience. Both of these steps are available as services that cost a whole lot less than trying to buy a meta search service to compete with Google, Priceline, Expedia and the new kids on the block, Airbnb.